Again, this has been left for too long, apologies those to those keen to pray for us. It has been a few months of very real life. We welcomed our newest member of the family as Theo was born to Mark and Anna in July. That same week one of our friends, Steve, who we have been getting to know at the pub quiz, died very suddenly. One of our families is also dealing with broken relationships. Throughout it all, though, we feel encouraged and greatly blessed. We have been learning from Luke’s gospel that He is in control and can be trusted to do what is best for us. The urgency for The Gospel to be shared in Hilton feels stronger!! We have had a few visitors over the summer, who are part of other fellowships outside of Hilton. Pray that they would be wise in their choice as to whether to join us. As we grow stronger as a core group we are starting to prepare some ideas of things to engage the local community more explicitly. Pray that these would forge string relationships and lead to gospel sharing opportunities. Now as a group of 8 adults we are enjoying our times together and seeking to continue to get to know each other better so we can truly be a Godly support to one another in our real lives. We also have a new family planning on joining us at the start of March, if house moving processes continue to go well. Mark and Anna are also expecting the first Grace Church baby!! We have changed our weekly pattern slighty and now meet for Bible Study on Tuesday evenings. In this time we are going through a new resource called Uncover, which is short series of studies in Luke’s gospel. They are specifically designed to read 1to1 with non-Christian as a way of introducing Jesus and the Christian Faith to them. We are going through as a group in preparation for opportunities we may have to read it with a contact in the village. Then on a Thursday night some of us have started going to a local pub quiz. Apart from enjoying ourselves we also hope this will be a good situation to invite people to join us in. A non-threatening environment where people can meet us and get to know us. Although winning the quiz is not the primary objective, we were disappointed with 8th place last week! We have now started meeting as a church on Sundays. Times have varied, but we start with drinks and chat before a time of praise, prayer and preaching. We have started looking at Luke’s Gospel, written to make us certain about Jesus. On Thursday evenings we are studying Philippians together, up till Christmas. 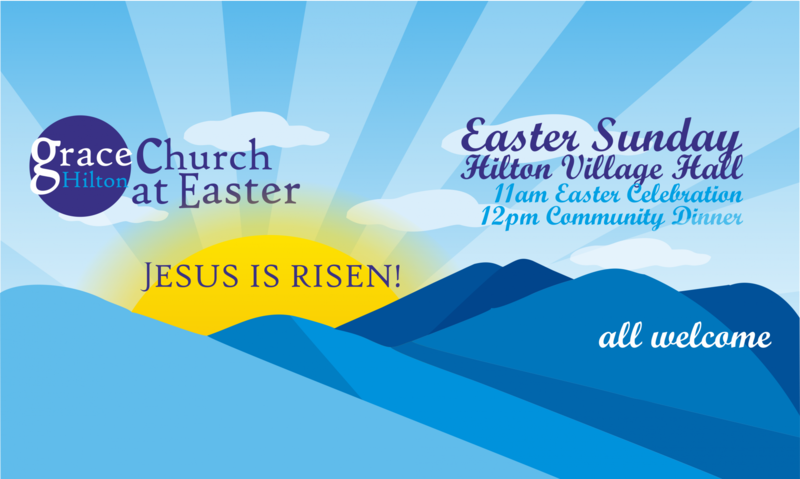 We have invited other Christians living in Hilton, but going elsewhere for church, so that they can meet us, get to know us and decide whether God is calling them to join Grace Church and join our mission to reach the people of Hilton with the Gospel. In considering a wider network and accountability we are deciding whether to affiliate to the FIEC. We have met with John Stevens, one of the directors about this, and we will meet with Andy Patterson in a few weeks, who is the director for Church Planting. We all now live here. The Selbys moved in July and we praise God for a calm and smooth moving process. They are now settled in well. Also, Jonny has moved in with Chris. He is a graduate who has started work at JCB, just up the road. Mark and Anna have met their new neighbours and are starting to get to know them, as well as starting to meet other parents as Cerys begins pre-school. Jonny has starting playing for the local football team. Chris starts back at Cubs after the summer break. Pray that we would become friends with the various people we meet, in different situations, and that we would be speaking of The Lord and His glorious gospel. Next Sunday will be our last time as part of Woodlands, the church we have been part of for the past year or so. We will then start to meet, albeit as a small group, in the Selby home. Pray that we would grow in fellowship together as we study God’s Word and praise him together. We had hoped to announce that the move into Hilton for Mark, Anna and Cerys would happen today, but sadly solicitors were not ready in time so it has been delayed. It is imminent, though, and as soon as the relevant paperwork is in the right places, it will happen. Those considering joining us have all decided against it before the introduction group started. We are still continuing to meet weekly for prayer and fellowship, and when we are all in Hilton we will start to invite the other local Christians we have had contacts with. Chris has started helping at the local cubs group, which is going well, and we have also made some contacts in the local dog walking group. Slow going, but progress nonetheless. Selbys sell and buy in a weekend. After 10 months on the market, the Selbys sold their house just before Easter, and then had an offer accepted the next day. Hopefully, in The Lord’s Will, the various processes involved in buying and selling houses will go smoothly and they will move into Hilton in 6-8 weeks. For various reason we have delayed this a little, so the home group will start now on 13th June after half-term. This will be a temporary group for those people considering whether to join us or not. Chris continues, albeit slowly, to make contact with people in Hilton, and some people from work at the University who live in Hilton. He is also planning to invite neighbours to a ‘house warming’ of sorts, soon.